If you’re looking for a scrumptious and relatively healthy option for dinner then this is exactly what you need! The mix of beetroot, cranberries and purple grape gives it a wonderful sweet and sour taste and the spinach gives you a great portion of leafy greens. So eat up and enjoy! Combine all the wet ingredients and spices in a blender so they all begin to infuse. Then pour this mixture over the chicken thighs and leave it to marinate for one hour. Heat a dash of oil in a pan and add the thinly sliced beetroot and the chicken with all the marinade. Allow the chicken to cook until it’s golden brown. Add the kidney beans, spinach and cranberries to the above and stir in 300ml of purple grape juice. Leave to simmer for 30 minutes with the lid on. Then serve with brown rice, sweet potato or quinoa. Thinking about the weekend already? I am. 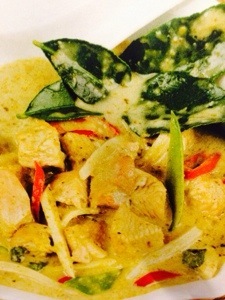 Instead of rushing for the takeaway menu this weekend I’m going to create my own quick and easy Thai Green curry recipe. Takeaways can be convenient but sometimes it’s just as easy to make the dish at home, and what’s more you know exactly what is in it and you’ll probably save some money too. What more could you ask for? Pan-fry 100g of chicken or turkey breast with 1 green pepper, sliced and 1 red chilled (deseed to reduce the heat). Add a can of coconut milk and 1tsp fresh Thai green curry paste. Season with coriander and serve with 50g of brown rice. Delicious! What’s your favourite indulgence food?